A company is made up of a workforce that functions as one comprehensive unit, working towards a distinctive goal. Each employee performs his or her individual function without interfering in what someone else is responsible for doing. There are many different kinds of employees. Some employees are average and follow instructions well, some are lazy and need to be constantly pushed and then there are those employees who are truly exceptional employees who are above reproach and serve as models to the rest. 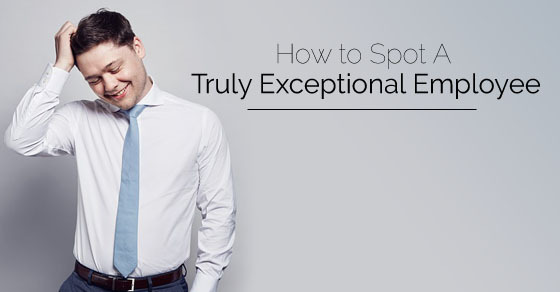 Here are some ways on how to spot a truly exceptional employee. What Makes an Exceptional Employee? Truly exceptional workers are those who always act in a professional manner at the workplace and never let their emotions get the best of them at any point in time. They act in a manner which is expected of them and they never disappoint their seniors in terms of the way in which they act. Whether things go in their favour or not, they always make it a point to conduct themselves well, so that they do not come across as being immature or unreasonable. They are truly classy and will never do anything to put in jeopardy their own reputation or even that of the company which they are working for. A truly exceptional employee is very goal oriented and they never stray away from doing the task at hand. Rather than indulging in petty workplace politics or gossiping about other coworkers, they simply devote and channelize all their energies into doing the best that they can. They value the company name and the resources of the company and will never do anything that would show the company in poor light. Being goal oriented is something which not all employees are capable of being. Such a truly exceptional employee will never act in an arbitrary manner rather they will try their best to carry out the instructions and orders given to them in a proper and befitting manner. Following instructions is something which all the employees do not do. Many of them look for ways to cut corners rather than having to do anything difficult and trying. What makes an exceptional employee is their ability to stick to the status quo and respect those in the company who are higher in authority. They try their best to learn from such seniors. The main thing which makes an employee truly exceptional is his ability to think positively all the time no matter what. There are many employees who lose faith and hope when things might not go their way but a truly exceptional employee will work through the problems and hurdles without buckling and crumbling under the pressure. Doing something like this is never easy but that is the mark of a true professional and this is the very thing which separates a truly exceptional employee from others. Top companies are constantly on the lookout for those employees who they can count on and those who have leadership qualities. What differentiates the average employees from the exceptional ones are the leadership skills which they have. They are able to masterfully handle tough and complex situations which suddenly present themselves. No day in the business world is easy. Every day is challenging in its own way. An exceptional employee is one who does not seek to boss over others, taking control is something which comes rather naturally to him. He never has to pretend or put on a show. The chief attribute of someone who is an exceptional worker is that he has the ability to speak very well indeed and presents his thoughts and ideas in an easy and comprehensive manner. The ability to be able to communicate effectively is something which all employees cannot boast of. There are only some special employees who have the gift of the gab and are able to not merely talk the talk but also walk the walk. In addition to being able to speak well, they are also very attentive to whatever is being told to them and if something is told to them even once they make sure that it is done, without fail. Exceptional employees are those who deliver top quality work at all times. No matter what the odds are, they never make any excuses and they are never pulled up for the work which they have submitted. They are very well read and theoretically very sound and that is why their work is never boring and dull but always cutting edge and one of a kind. They seek out new ways to surpass themselves and they never like to disappoint their seniors. Their work is never considered as a burden to them as they love what they do and follow their heart and mind at all times. One of the main attributes of someone who is a truly exceptional employee is that he or she has a tremendous amount of self-belief and self-confidence. You will never find a truly exceptional employee doubting himself of seeking approval from everyone around him. He seeks counsel when he is in doubt but he will always act according to his own best judgments and he will never act in a corrupt or unjust manner. His self-belief guides him along the way and helps him to choose the right path. He has courage in his own convictions and will never shy away from speaking his mind or standing up for what he believes in. By virtue of the top quality work which such employees deliver, they are able to inspire those around them. Their co-workers constantly look up to them and even seek their advice when needed. With their exceptional performances, they silently serve as a shining example to those who are around them and they encourage them to pull up their socks and do as best they can whenever any challenge is thrown their way. Having employees like this in the office is bound to better the work environment and bring out the best among all the employees. A chief example of the exceptional employee is that such workers do not seek popularity, name or fame. They just focus on the job which they have to do and it is the quality of work which they deliver which gets them much acclaim and causes others to sit up and take notice of them. There are many employees who will do whatever they want to climb the ladder of success without every sparing others who they are trampling over in the bargain. It is not for nothing that people say that the business world is a cut throat and treacherous one. Truly exceptional employees are distinctly different from regular employees and spotting such employees is not a tough task at all. Such employees work in an unobtrusive manner without constantly thinking of ways to attract attention to themselves. They do not work to achieve any kind of praise, rather they work to better themselves and to learn new things along the way. It is their passion which spurs them forward at all points in time and they do not look for praise in order to do better. They function as per their own ideas and they never do something which they think is not correct. Truly exceptional employees have nothing to prove to anyone else, they only try to live up to their own expectations. It is for this very reason that they are never intimidated or scared. Their manner of functioning is rather bold, transparent and methodical and that is why no one can say anything against them. You can spot a truly exceptional employee by the manner in which he is sure of himself and is never vulnerable. This does not imply that he is someone who is proud and difficult to work with. Exceptional employees are wonderful to work with, as they have so much to offer to one and all. You can spot a truly exceptional employee by the manner in which he will be willing to take calculated risks. Taking risks is something which is necessary in the business world. If you have done your research and think taking the plunge will pay off then you should not hold yourself back. An exceptional employee will never go against his gut feeling and if he knows something is going to pay off then he is bold enough to move ahead with it. Fear of failure is something which many of us have, but it is not something which exceptional employees have. It is only foolish employees who let their ego get the better of them. A smart and truly exceptional employee will never let their pride get the better of them; rather you can spot them by their utmost humility and honesty at all costs. They listen to whatever is told to them and even accept criticism with much grace and dignity. Rather than feeling bad when someone tries to give them constructive criticism, they look at it as a learning experience and encourage people to give them feedback for the work which they submit. Letting your ego get the better of you in the business world could be detrimental for you. There are many people in the business world who will never stand up and take the blame for something which was their entire fault. An exceptional employee is someone who is always willing to take responsibility for his actions. He will never let someone else take the fall for his mistakes and nor will he continuously try the buck on to someone else. It is by this quality that you will be able to spot an exceptional employee from one who is just below average. He will have the guts to stand up and face the consequences of his wrongdoings, in a mature manner. Finally, you can spot a truly exceptional employee from the manner in which they are always trying to gain new knowledge and learn novel things. They are rather restless and are never content with just any and everything. They do not hesitate to ask questions when they are in doubt as well. Truly exceptional employees are very hard to find nowadays and they are jewels which ought to be valued and revered. If your company is not willing to respect employees like these then there are going to be plenty of other companies who will be willing to accept such quality workers with open arms. As long as you keep them happy and continue to give them challenging tasks which they can excel at, you have nothing to worry about and they are sure to never disappoint you at any point in time. You should ensure that your company hires more such individuals as then only will the company be able to grow.